The wheelbase and overall length of the 2013 GS are the same as the 2011 GS 350, but the car is taller, the front track is 1.6 inches wider and the rear track is two inches wider. LOS ANGELES -- Brilliance comes from desperation. Since the mid-'90s, Lexus has tried to create a sport sedan with the cachet of the Mercedes E class and the performance of the BMW 5 series. In three generations, it has accomplished neither. Past Lexus GS efforts have done so poorly in sales and critical comparison tests that Toyota's board was ready to kill the upcoming generation of the car before launch. This is the last chance for the GS. It is also, by far, the best effort. The basics: Previous GS attempts were plagued with numb steering, floppy handling and choppy brakes. Yes, they were fast, but not much else. Add in bland exterior styling and vanilla interiors, and it's no wonder the car fared poorly against the Germans. The new GS 350 has a much tighter feel dynamically, though the electric power steering is still a touch vague. Through an autocross comparison test, the GS seemed more connected to the driver than the Mercedes E350, though it still couldn't touch the accuracy and response of a BMW 535i. As for the GS 350's looks, the aggressive "spindle grille" fascia will be polarizing, but at least it has some personality. The interior layout is more horizontal than is typical of most center stacks. An analog clock makes a return. The wheelbase and overall length are the same as the 2011 GS 350, but the car is taller, the front track is 1.6 inches wider and the rear track is two inches wider. The base sedan is rear-wheel drive, and there is an all-wheel-drive edition. This platform also will be the underpinning for the next-generation IS sedans that will come late next year. For those who miss the thunder of a V-8 engine, the V-6 comes with an intake baffle that delivers a bit more rumble to the cockpit. 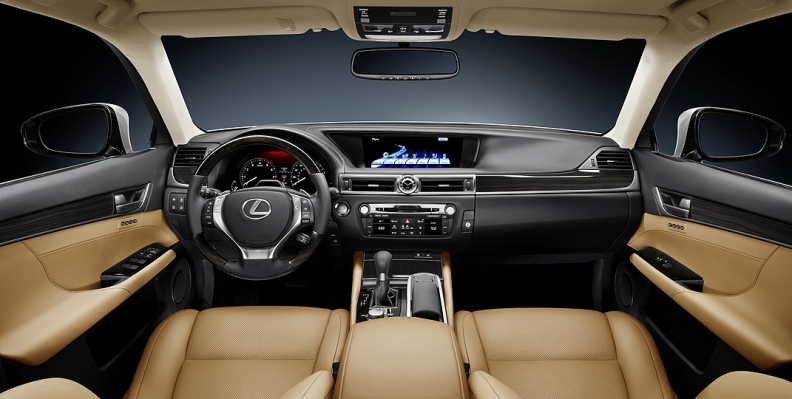 Not that the engine lacks grunt: The GS 350 goes from 0 to 60 in 5.7 seconds. The double-wishbone front suspension has new geometry and a greater use of aluminum. The changed rear suspension design has moved the spring from a coil-over shock to a more inboard location, which helps with trunk space. An adaptive variable suspension is optional, allowing for stiffer suspension settings. An optional four-wheel steering system uses variable gear ratios to help the GS through tough corners. Notable features: The GS 450h hybrid generates thrust equivalent to a V-8 engine and gets a real-world 31 mpg. The hybrid's engine has changed from an Otto to an Atkinson cycle for better fuel efficiency, while the electric motor makes up for the Atkinson's flat spot in the torque curve. Manufacturing advancements include both laser and spot welds in crucial areas such as wheel arches and suspension-mounting points. For certain structural pieces, Lexus developed a type of ultrahigh-strength steel that can only be formed when it is glowing hot. Weight reduction was a key objective, whether it was the thickness of radiator hoses or the clamps that hold them. Still, all the added technology means the car is heavier. A new generation of Lexus seats debuts with the 2013 GS, including an optional seat that adjusts to articulate through the entire curvature of the spine. Another neat touch: The cross-section of the steering wheel changes its radius, making rapid rotations of the wheel easier. Standard features include moonroof, 17-inch wheels, paddle shifters, LED interior running lights, bi-xenon headlamps, 10-way power seats, rear air conditioning vents and Bluetooth connectivity. The 10 airbags include front knee airbags and rear-occupant torso bags mounted into the seats, in addition to window curtains. When the navigation option is chosen, the 12.3-inch information screen is wider than that of an iPad. A new generation of Lexus seats debuts with this vehicle, including an optional seat that adjusts to articulate through the entire curvature of the spine. Another neat touch: The cross-section of the steering wheel changes its radius, making rapid rotations of the wheel easier. And, finally, there is a Japanese car that has lane-change turn indicators that blink three times when the signal stalk is lightly toggled. The GS also comes in F-Sport trim, which is a factory-built performance pack that includes 19-inch wheels, larger brakes, stiffer suspension, variable gear ratio steering and bolder design cues. What Lexus says: "The GS plays a much more important role for Lexus," Mark Templin, Lexus Division general manager, said at the press introduction here. "It's a bolder, more confident direction for the brand. There is no going back." Compromises and shortcomings: There's no V-8 version; Lexus says the take rate was low, and more people were willing to pay a premium for a hybrid. Also, while other luxury brands are going to seven- and eight-speed automatics, the GS sticks with a six-speed -- although the shift timing has been improved. 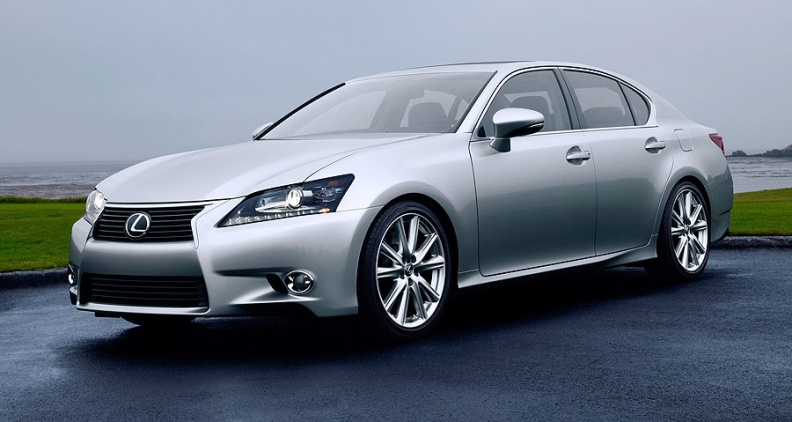 The market: The GS 350 goes on sale in February; the hybrid shortly thereafter. Lexus hopes to sell 20,000-25,000 units annually. The current generation peaked at 15,759 units in 2008, although the GS series sold 33,457 units in 2005. The Lexus brand has a 40 percent conquest rate for sales, due to its high owner loyalty, but it wants the GS to conquest at a 60 percent rate. Lexus will kick off the GS marketing with a Super Bowl commercial, the first time the brand has been involved in the game. The skinny: Lexus bosses persuaded Toyota President Akio Toyoda not to kill the GS. But can Lexus convince Americans that the GS is better than the E class or 5 series? That may be a tougher pitch.